According to The Book of Food published in 1927, a woman who cannot make soup should not be allowed to marry! 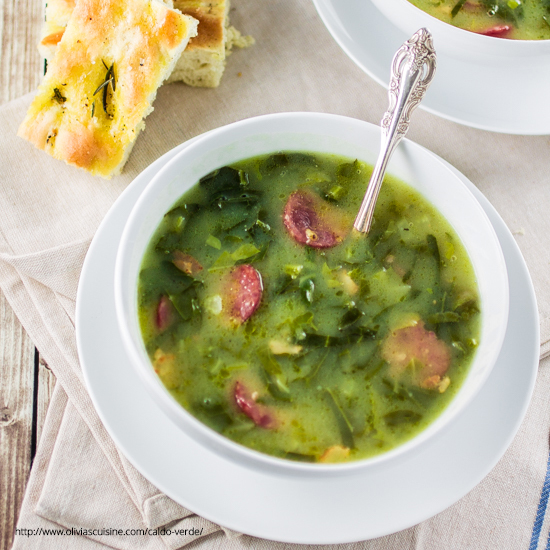 In Portuguese homes, soup is traditionally served with every meal. In the north of Portugal soup is sometimes even eaten after the main course, some saying that it helps to “wash down” a heavy meal. Preparation & cooking time: 40 min. 1) Start by cutting the collard greens (or kale). Cut them crosswise into very thin strips and place aside. 2) In a heavy-bottomed pot, add the peeled potatoes, quartered onion, minced garlic, olive oil and the chicken stock. Bring to a boil over high heat and then lower the heat to medium-low and cook until the potatoes are tender and ready to be mashed (about 20 min.). 3) Mash the potatoes and bring them back to the pot. Using a hand blender, blend the soup until smooth. 4) Add the collard greens (kale), stir, and keep cooking for 15 min. 5) Add the sausage to the soup and cook until the soup boils again. Serve hot with extra olive oil. The creaminess of this soup varies according to taste. If you would like your soup to be a bit creamier, just add more potatoes. You can add as much as you’d like and just use water to thin it out if it gets too thick.